I get asked a lot… can guppies live with goldfish? So when you are visiting your favorite aquarium you see lots of different fish living in harmony. They look amazing as they interact like they are the best of buds. It definitely is ok to mix species but you need to do your homework. Not all fish will be able to live together. An Angel fish may look beautiful but if you mix it with a small placid fish you are in for a bumpy ride. This little fish would become prey for the Angel Fish. In this post, I am going to explain why it is not a good idea to keep sweet little guppies with goldfish. These beautiful little tropical fish can be found in the wild tropical water of America. These fish were raised to control the mosquito numbers. Guppies would eat the mosquito larvae. This brightly colored fish will only grow to about 2 inches. This makes them the perfect fish choice for smaller aquariums. You would naturally think that it is the female that boasts the beautiful colors. 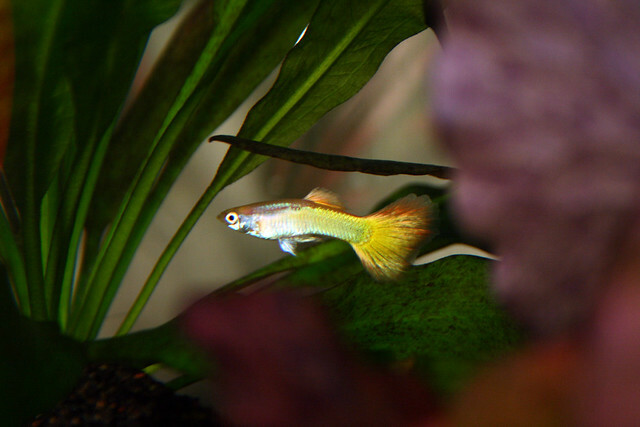 However, it is actually male guppies that are more colorful. When you set up a guppy tank you need to make sure that you have a heater. These are found in the wild in Tropical America, meaning they like a tropical water temperature. To satisfy these little beauties you will need your water around 74 and 84 degrees Fahrenheit. So the first thing you need to know before you mix guppies and goldfish is can they live at the same temperature. Now I have said before that goldfish are pretty hardy and adaptable. You want happy fish… right? Will this temperature be comfortable or will they have to adjust to feel comfortable? So let’s look at the water temperature that goldfish like. They prefer water temperatures between0 68 and 74 degrees Fahrenheit. Having said that, goldfish definitely prefer the cooler temperature. So if you set the heater in your tank to 74 degrees Fahrenheit, you would create a cool but comfortable environment for the guppies and a warm but comfortable environment for the goldies. So that means they can survive in the same water. Now the next thing you have to check is the safety between the species. Goldfish can grow up to 12 inches and guppies will only grow to about 2 inches. This is quite a big difference in size. Goldfish are omnivorous which means they like meat and veg in their diet. This means as the goldfish grow they may think that the guppies are in fact food. Not good for your little gupsters. I actually saw this first hand. Again it was down to a beginners mistake. I didn’t check if it was possible for these two to mix, I just hoped for the best. Unfortunately, this led to disappearing guppy syndrome. Goldfish may seem placid but in this tank, they were nibbling at my guppies, mollies and even my gourami. For this reason, I would avoid placing the two together. Guppies produce waste just like goldfish but the problem between the two is the sheer wealth goldfish produce. They are messy big fish. If your water filtration is slow that means that the water quality will be reduced. Goldfish like more acidic water and guppies prefer more alkaline. This doesn’t separate them but it means you will have to keep the tank at a more neutral PH. Frequent water changes will be a must to prevent acidic conditions. If your life will not be complete without a guppy or two I would suggest that you start a brand new guppy tank. This might sound like a lot of work but guppies are small. You don’t need a massive space for them. In my article about common goldfish tank size, I mentioned your tank size should be 1 gallon per inch of fish. That would mean to keep 4 guppies your tank should be about 8 gallons. As guppies normally grow to 2 inches, 4 of them would give you 8 inches of fish. That means you need 8 gallons of water. I would suggest just opting for the 10 gallons for 4 guppies. These are fish that like to dart about and the extra space will keep them happy. The Fluval Edge Aquarium with LED Light would be my choice of tank. I love its unusual square shape. If you just want to get your first tank then there is a lot of basic tanks like this one. At $90 it is a better option if you are on a budget. Both of these come with a filter but you will still need a heater. I would suggest the Marineland Precision Heater for Aquarium. This will set you back $25 but it will work hard to keep the temperature consistent. This means happier guppies. Can Guppies Live With Goldfish? You might dream of keeping guppies but adding them to your goldfish tank really isn’t a good idea. You would actually be endangering the guppies. Goldfish are bigger and hardier. They produce a lot of waste, a lot more than those little guppies. I hope this post has answered the, “Can guppies live with goldfish,” question. https://successfulaquarium.com/wp-content/uploads/2017/08/Can-Guppies-Live-With-Goldfish.jpg 764 1280 Joseph Elliott http://successfulaquarium.com/wp-content/uploads/2017/08/logo.png Joseph Elliott2017-08-21 08:00:362018-04-30 13:00:50Can Guppies Live With Goldfish? Are They The Perfect Tank Mates?